Lenovo and Motorola have already confirmed they will have a busy summer with multiple smartphone launches. The new generation of Moto X, Moto G and Moto E smartphones are expected to arrive in the next couple of months. We're not sure what smartphone Motorola will launch first, but we know that at least two of them will be commercially available in August. According to a new report, Chilean carrier Entel will launch the Motorola Moto X Sport and the “Nuevo” Moto G, which might translate onto “the new Moto G,” sometime in August. A few screenshots taken from the carrier's inventory provides us with some info on their specs. Since we already know a great deal about some of the Motorola smartphones that will be announced this summer, the new info comes to corroborate some of the details we already have. 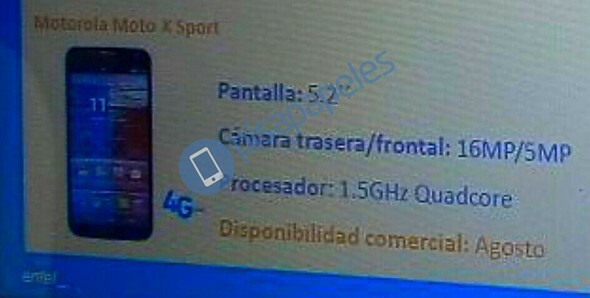 That being said, it appears that Motorola Moto X Sport will sport a 5.2-inch capacitive touchscreen display possibly with full HD (1080p) resolution. Also, the smartphone will be powered by a 1.5GHz quad-core processor, but the model is not mentioned in the leaked screenshots. We also know that Motorola Moto X Sport will boast a 16-megapixel rear-facing camera with LED flash, autofocus and video recording, as well as a secondary 5-megapixel camera in the front. Moving on to Motorola Moto G (2015), the possible name of the next smartphone in the Moto G series, the device will feature a 5-inch capacitive touchscreen display that should support 720p resolution. On the back, the phone has been confirmed to pack a 13-megapixel camera with LED flash, autofocus and video recording. In the front, the Moto G (2015) will features a 5-megapixel camera for selfies and video calls. Last but not least, Motorola Moto G (2015) will be powered by a 1.4GHz quad-core Qualcomm Snapdragon 410 processor, which will be complemented by 1GB of RAM and 8GB of internal memory expandable up to 32GB.